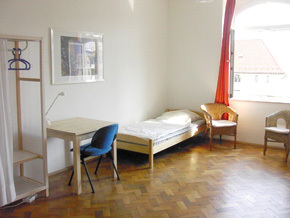 Bed and breakfast is provided with carefully selected host families, where a twin room is shared with another student of a different nationality. Half-board and single rooms are available at extra cost. If you want to live in a German speaking environment you should choose a host family, which you can book either with breakfast or half board. It could be a single person or a couple. We have carefully selected our host families. A host family could be married or unmarried couples, with or without children or single persons of any age. Our students' apartment with single or double rooms or single apartments, both self-sufficient are available to students who like to be more independent. If you would like to get to know people of your age you should choose this option. You can decide between a single and a double room, you will be sharing the kitchen and bathroom with all students living in the residence. The minimum age is 18. 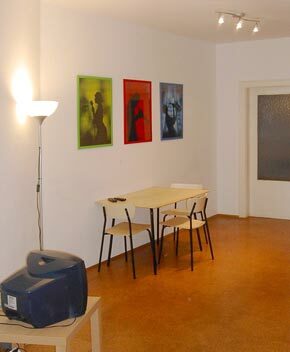 If you like to be completely independent you should choose the private studio apartment. A room with a kitchenette and your own bathroom will be at your disposal. The apartments are simply furnished and can be used by a single person or you can bring a second person at extra charge. The minimum age is 18. 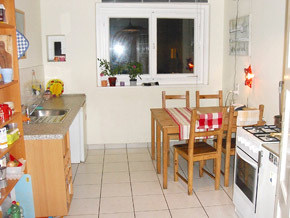 This type of accommodation offers a high standard to those students who would like to have their own private apartment with a 3-star hotel standard. There is a fully equipped kitchenette, a private bathroom as well as further amenities. The minimum age is 18. On request we are happy to book hotels or Business Apartments for you. We can arrange your pick-up from the airport/train station for a charge of Euro 60,-.